"I believe, but help my unbelief!" That's what the father of the boy with convulsions said to Jesus (Mark 9:24). This must sometimes be our prayer, too. 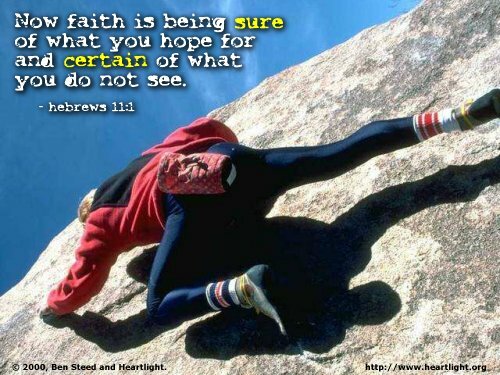 As we look at the great heroes of faith in Hebrews 11, we know this must have been their prayer as well. Their faith wasn't always perfect. Their trust wasn't always mature. But, they stayed at it; they believed and acted with a relentless assurance that somehow, some way, God would act and deliver. Let's stay at it with that kind of faith, too! Dear God, "I believe, but help my unbelief." Please mature and empower my faith so that my life will be a steadfast and consistent testimony to your presence and grace. In Jesus' name I pray. Amen.